So on my little furniture shopping trips, I often run across old, sad looking sew machine cabinets that nobody wants or needs anymore. Some of these pieces are pretty cool and unique. Although most of them have little drawers that can not hold much, I have found cabinets with some good size drawers that would be perfect if converted to a desk...only if it wasn't for that big fat HOLE in the middle! Here are a few options that I have come up with to work around that big fat hole! 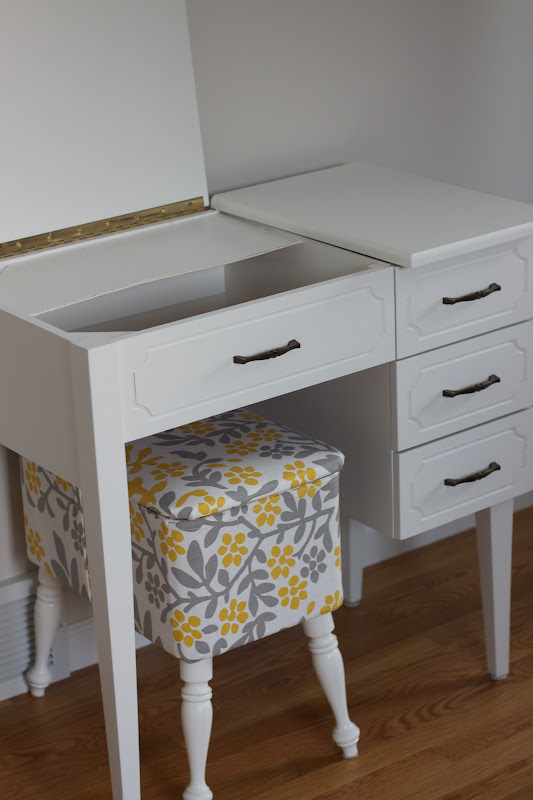 Simply tack down the flaps and putty the seams...making for a nice, simple desk. Or do what we did here...tacked down one side of the "flap", build a box under the area where the sewing machine would go and add a piano hinge to the other "flap". Makes for an awesome vanity! Here is my new FAVORITE! I have been obsessed with (SOO many things) painting glass, in particular....back painted glass and have done it in different projects around my home. I love, love, LOVE the color coral and gold together and thought this would be a perfect project to use color combo. I had a sheet of glass that was from an table project that had cracked on the edges. I took this to my friends over at Vos Glass where they cut my broken piece to the perfect dimensions of this desk top. In one spray booth I was spraying the beautiful coral lacquer color. In another spray booth, I was back painting/spraying the glass and the original hardware in this gorgeous metallic gold color by Valspar. I sealed both the hardware and the back-painted glass for durability. See what is underneath the glass I put on top! A big ol' hold! But who cares! With this beautiful sheet of metallic glass on top you would never know! And check out the nice, deep drawers on this piece. Thought I would do a quick post on this pretty little piece! It was one of those situations where you ALMOST walked away, your driving home thinking "I should have just walked away" but are so glad you didn't! I'm loving the beautiful deep blue color we chose. It is actually called "Deep Sea Blue" by SW. And I really think spraying a color on this piece makes the pretty details pop out even more. And who doesn't love glass knobs? Now just for a second...ignoring the dusty lamp and annoying bright flash, would you just TAKE A LOOK AT THAT AWESOME FINISH!!! Seriously! Could never achieve this finish with a paintbrush and roller, or even with someone who does have a sprayer but does not do quality work. Not sure why I do this...buy old chairs I don't even need and reupholser them. I obviously have an addiction to either cool old chairs, pretty fabrics I don't know what else to do with or simply torturing myself with 6 week projects. I sure it's all the above. Here is a set I picked up. Pretty slipper chairs. I have tackled similar projects before, but nothing this involved, where I needed this metal strip tack thing and this cardboard edging thingy (thank you sweet man at the upholstering store for donating to me:). 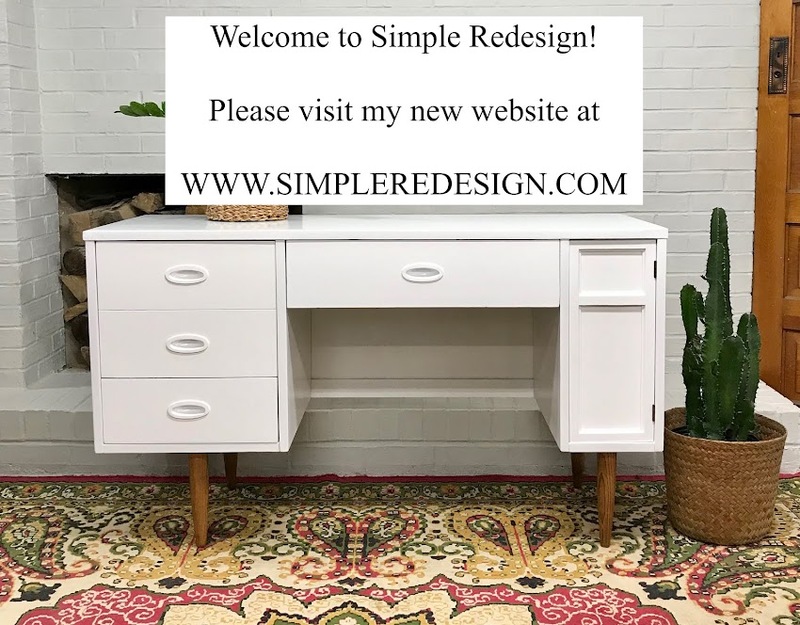 This really is not a tutorial at all, I have tried to block out the entire incident and do not remember much of the process, but there are a lot of talented woman on DIY blogs with some great step by step tutorials. Here they are before...isn't that awesome that I took a picture of the backs but not the fronts? Seriously Julie?! I started by removing the fabric so I could paint. I made sure to keep all the pieces so I could use them as my template for the new fabric. My original plan was to do a Restoration type whitewash and grey stain technique on the frames. After I added the stripper to the chairs and started scraping, I quickly realized the front legs were not wood...but plastic:( I was not only bummed because I could not do my original finish, but the stripped ate away at the plastic so much that I had to so some serious sculpting with my wood putty to make it look good again. Plan B...I painted it white. Here are just a few pics of the "during" process. Notice the condition of my living room in the background pictures...it looked like this for weeks! LONG story short...here is the end result:) Not perfect by any means but I learned a LOT. Here is a sneak peek at a current project I am doing. I am helping my mom and my darling 93 year old grandma, who lives with her. do a VERY budget friendly DIY kitchen update. Here are a few "before" and "during" pictures. Here we are prepping and sanding down the frames. The cabinet drawers and doors are at my house, took them home to spray. Here I am, spraying the frames. I sprayed the doors and drawers at my house. I have always loved the look of metal screens that you would use to cover an old radiator. In fact, I have incorporated in somehow on every one of the house that we built or renovated. There are a few different designs and colors to use. I typically find mine at Homey D or Lowes. In this particular case, I built a window seat in our office wanted a built in bench to "look" like it was an old radiator that I had built a box around. Bad picture, I know, but you get the idea. I have used them to cover in wall speakers in 2 homes and here, in our current home's retro Nutone. Check out the nasty before picture of the original fabric! I must have REALLY been bored this particular day.... I created a magazine holder out of the extra metal screen to make a magazine holder for the 1/2 bath of out current house. Wish I knew I would be starting a blog a year ago! Not sure how to tell you how I did this one, but with a little creativity and an hour of nothing better to do, I came up with this! I always keep the left overs and make little things here and there...so I though I would share a few simple ideas. 2-with a small pieces of wire, pull through holes and twist to secure. 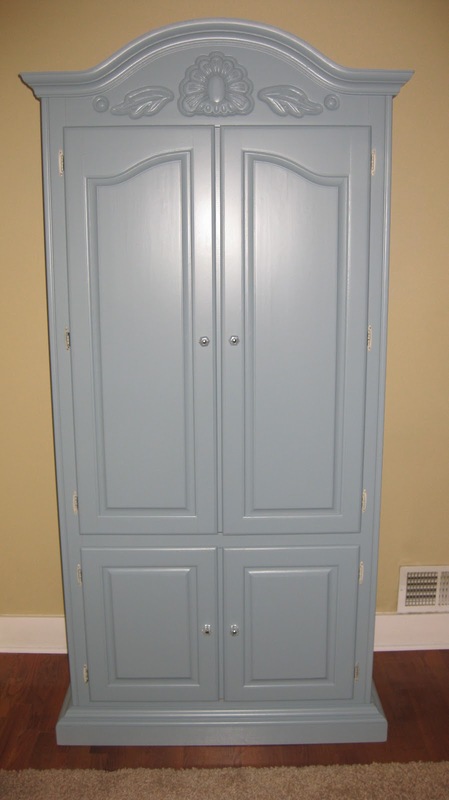 Most of us have one, an old armoire we really don't need anymore taking up space in the basement...I know I do! Although most of us have moved on to the flat screen t.v. 's we are always still in the market for more storage, right? I have a mudroom reno coming up in the next few months of my own and have been brainstorming ways to incorporate an armoire into the space to use as extra closet and storage. I still have not figured out why it looks like I have 8 kids whenever I walk into the mudroom when I only have 3! Anyway, I recently refinished an armoire for a friend who needed more storage in her beautiful home that does not happen to be overflowing with closet space. They have the flat screen over the fireplace, but decided to use an old armoire that they had in storage for the past few years, add shelves inside and put in her living room to hold blankets and toys...turned out super cute! Here are some other great ideas that I found on pinterest. So many ways to use old armoires or hutches in a more purposeful way. From a craft center, computer station, pretty storage in bathroom or closet or extra pantry storage space. FROM SERIOUSLY UGLY TO SUPER COOL! I know this was originally a sad looking dresser and nightstand set, but it was solid wood construction, dovetailed drawers and had such great character. I'm a sucker for curved drawers! So glad I didn't pass it over!